Austin left us far too soon and left behind a multitude of happy memories that are helping us cope with his loss. He filled every role required of him with ease, show dog, companion, protector, clown, comforter, confidant, he could do it all with a true zest for life. Rest in peace sweet Botty, we know you are free from all limitations and were welcomed to the Rainbow Bridge by family and friends that went before. We will never forget you. Charlie Bale, longtime officer and member of the Oklahoma City Boston Terrier Club lost his valiant fight against cancer on Tuesday October 16, 2012. Charlie passed at home with his beloved wife Pam and their dogs at his side. 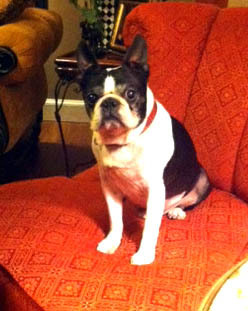 The family asks that in lieu of flowers donations be made to the Oklahoma City Boston Terrier Club. Services will be Wednesday, October 24, details to be posted as soon as available. For further information please contact Michelle Carter at e-mail, or 405-570-2040. We lost Ace Hopper in December 2008 at the young age of 6 to his 2 1/2 year battle with protein losing enteropathy. All dog lovers say you are very lucky to find your dog of a lifetime. Ace was truly that as well as a "heart dog." He shined in the Best in Show ring when he received a Group One in front of his hometown friends in Wichita Falls, TX in March 2005. He was shaking with excitement from the tips of his toes to his little tail on his last leg of his CD Obedience-"Sits & Downs" just to please his Mama. 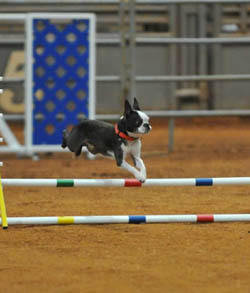 He was able to participate in the love of his life---Agility---to earn 3 agility titles last year. We are sure that he is still on the agility ring sideline awaiting his turn and making his unique request to go next. Ace Hopper sired 10 puppies and 9 became conformation champions. John - take care of Ace Hopper and give lots of hugs and kisses from his Mama. 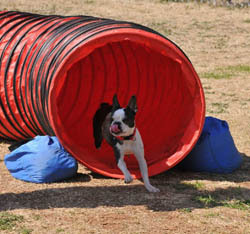 Copyright © 2011 ~ 2013 Oklahoma City Boston Terrier Club & JLS Canine Services Web Design.